Hundreds of African migrants are feared drowned after a boat carrying about 700 migrants capsized in the Mediterranean Sea. 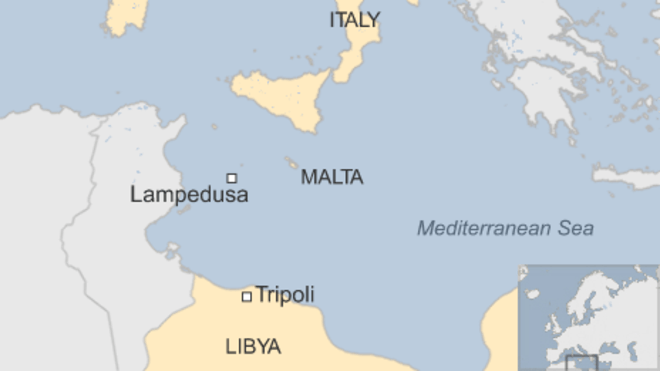 Italian coastguards have reported that a major rescue effort is on after a vessel carrying more than 700 migrants capsized just off the south of the Italian island of Lampedusa. The boat capsized around midnight and 28 people have been rescued. Last week more than 400 migrants were feared drowned after the vessel carrying them capsized just North of Libya. The rescue efforts have been spearheaded by the Italian coast guards and other vessels from the Maltese navy and a number of commercial vessels. The Times of Malta detailed the tragedy and said that many migrants fell overboard when the rushed to one side of the vessel to view a passing merchant ship. He further added that the fishing boat capsized about 130 miles (210km) off the coast of Lampedusa and 17 miles (27km) from the Libyan coast. Twenty ships and more than three helicopters have been pressed for the rescue effort. The latest fatalities have once again led to calls for a more vigorous search and rescue of the seas between Libya and Europe. There has been a surge in migration between the Middle East and Africa toward Italy with migrants who are trying to escape extreme poverty, war and famine from the failed countries straddling the North Africa.